Follow the steps below to make a head cleaning on Canon PIXMA MX360 printer if you have any other questions, just write a comment. If printing to a Canon PIXMA MX360 printer print quality is not the best, white streaks leaving their work to have the desired finish, you should clean the printheads on this case the cartridge as they are directly connected the same. 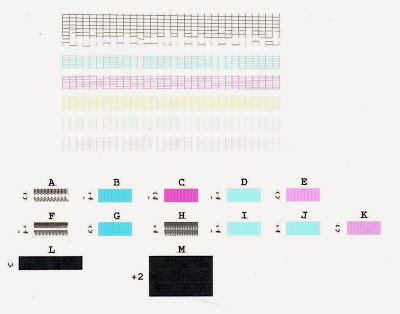 The pattern you see in the picture is one with poor quality colors, more in the black, even if the tri-color cartridge is giving the same quality is necessary to make the head cleaning cartridge.Follow the steps below to get the best print quality with the cartridges can have now, the cleaning head in this printer can do much of the administrative panel of the printer or from the software is installed, here two processes. It should be clear that this process consumes much ink cartridges with the head cleaning uses ink to unclog injectors, therefore it is recommended that this process only when necessary. The printer starts cleaning the heads — it's a process that could confuse as if the printer is printing a document — we hope to complete and print other documents to verify the quality. Here you can get a more exhaustive cleaning head, as the head cleaning thoroughly available, allowing repair nozzles with more intensity. The first thing to do is to arrive at print devices, easy way to learn is by reading the following publication on devices like going to print no matter what Windows using. After reaching this printer where we need to go to the properties, usually in the printers installed in Windows XP, it is the last option, Windows Vista / 7 / 8 is the fourth option from the top down. It opens a window where you must select maintenance - top right - then click head cleaning or head cleaning thoroughly, here it can choose to print a test pattern after completion of the cleaning for the quality obtained. If the print quality does not improve, unfortunately you must replace the ink cartridges, it is recommended to buy original ink cartridges or remanufactured any other questions, write a comment.